If you're like most people, your home is your largest asset. Selling your home is an opportunity for financial gain or loss. It can also be a big time commitment. We are committed to helping you get the best price for your home and also saving you a lot of time and frustration. We'll admit a yard sign is pretty basic, but studies still show that it is 3rd largest source used by buyers when finding a home (right behind their real estate agent and the internet). Our Berkshire Hathaway HomeServices Select Properties yard sign, sign riders, directional arrows and even in-the-home feature cards will promote your home 24/7, directing buyers to the office or web for more information. Your home needs to capture the interest of selling agents. If the agent is not motivated to show your home, their buyers may never see it! We can reach out nationally to the Berkshire Hathaway HomeServices network and locally through the multiple listing system and private broker receptions to get your home noticed. We have combined the best of old and new media to attract people to your open house. Our methods include on-site visuals such as 'open' signs and balloons to attract drive-bys and online open house search engines including bhhsselectstl.com, STLtoday.com, Zillow, Truila and Realtor.com. Full color, glossy postcards will be sent to your neighbors and surrounding neighborhoods announcing that your home has been ‘just listed.’ Quite often purchasers are found in the immediate area because neighbors know the benefits of living nearby and are quick to tell others who they’d like to live closer to them. Ask your agent about our property business cards. These cards feature a photo of your home and property details so you can distribute them to friends and family. They can also be available as a take-away for showings and open houses. Full-color flyers will be available at your home as a take-away piece for showings, drive-bys and open houses. More than 3 out of 4 home buyers use the Internet to find their new home according to a study by the National Association of REALTORS®. This data shows a significant shift away from print to online resources. Because of this, we have spent the last several years positioning ourselves as an online leader through our web-based systems, online relationships and dynamic marketing initiatives. bhhsselectstl.com | This is the Berkshire Hathaway HomeServices Select Properties' site where we will feature an online showcase of your home, as mentioned above. Our primary goal is to drive local traffic here and we do this through our digital advertising and by securing placement on major search engines. berkshirehathawayhs.com | Advertised online and on television, our national web site is a significant source of buyer prospects. Your home will be showcased nationally and internationally on this site which uses registration forms to capture prospects. Zillow | Realtor.com | Trulia | These are the Big 3 of real estate websites and we make sure your home is searchable on each. What happens when someone makes an online inquiry on your home? Will the potential buyer get a fast response? Any online interest on your listing from our site instantly generates an email and text message to your agent's cell phone. It's not enough just to market your home. We want to provide you with results. With Berkshire Hathaway HomeServices Select Properties you’ll receive consistent updates about your home’s showings, open houses, online activity and comparable market activity in your area. Electronic notifications allow you to easily confirm, decline, or re-schedule showings based on the method that mest works for you— text or email. Download the ShowingTime mobile app for complete access to future or past showings, your listing activity report and feedback to give you an up-to-date overview of what buyers and showing agents thing about your home. Your agent can provide you with an open house report detailing the number of visitors that attended your event, how they found your home’s open house information, and the number of visitors that expressed interest. Your agent can provide you with a monthly report detailing any print marketing done on your home including ads, postcards and brochures. Weekly reports of online activity will be emailed to you detailing how many times your property has been listed in search results, how many visitors have looked at your home online and how many visitors have saved. 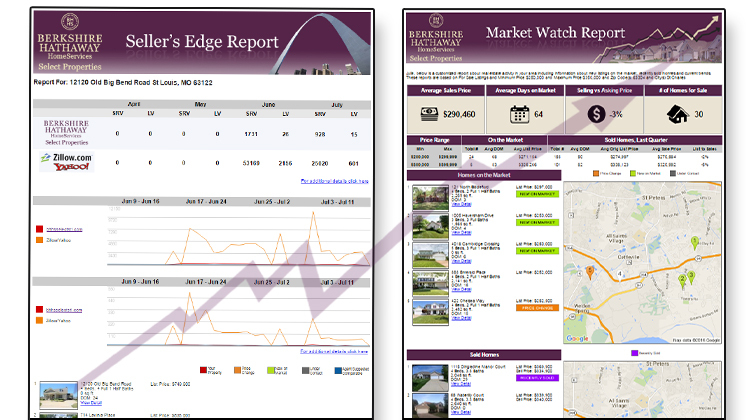 Get detailed information from bhhsselectstl.com, Zillow.com and Yahoo Real Estate. It’s important to know the activity of comparable properties. That’s why you’ll receive a weekly emailed report that shows properties listed near you and any price or status changes they may have undergone.